Hey Dude! The clips on the back of those three pieces last for only one use ... attach to car and .... break when they're removed. It looks like Steve is selling a set on eBay that have been repainted however it neglects to inform the buyer that all/some the clip pegs are broken. Also consider that if all attaching pegs are intact and you're able to locate a set of clips, things will break during assembly. Assume the worst on these brittle NLA parts. The first time my car needed a new glass, the installer stated the only option was to use windshield adhesive to glue the trim back into place. I didn't allow that and told him to throw the broken trim in the boot of the car. James had just come out with the Spoonfed version molded of one continuous piece of c/f. I went that route with a matching cowl cover. 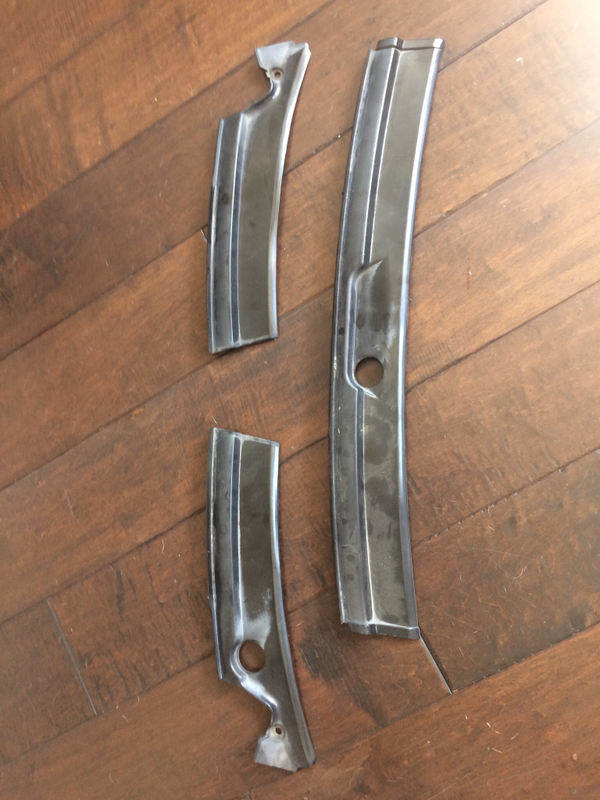 If you would still like the set of three I removed from my orig owner car they're yours for $50 + $5 shipped. None of the clips are broken but there is a spot that will need to be sanded/rubber smooth in the center from wiper arm kissing it for a day or two. If you are going to repaint them make sure to use a primer that etches the plastic prior to paint. The whitish areas are where the sun has baked in years of goodness. If you go the restoration route, use rubbing alcohol to clean them and Mother's Back to Black to restore them. Last edited by petethepug; 07-23-2017 at 07:24 PM. Sold to the Midwest! Thank you!